Fresh fish cannot be beaten – and we are very fortunate to have an amazing fish monger two blocks from our office. Being winter, I can confidently shop for fish and keep it in the cooler bag I got from Marks & Spencer. My choice for the day was gurnards, and for a first time try, the fish was awesome. 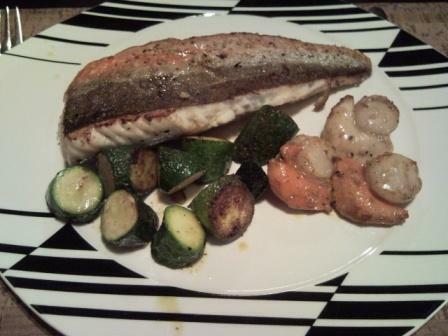 I should mention it was also very cheap – two lovely fillets for R15. For dinner I made Gurnards With Scallops. Gurnards are a locally caught fish. I try and eat as sustainably as possible. This means buying fish which is locally caught and appears on the green list. I also like to support local fishmongers. The Gurnards with Scallops dish was a bit of a compromise as scallops are not locally fished. But I could not resist buying them to make this meal a little bit more fancy. We but scallops when we are overseas and they are not so much of a special treat then. But in South Africa they certainly are. For this very simple meal I made sure the scallops were dry, and seasoned the fish and the scallops with salt and pepper. Both were pan fried until perfectly cooked and enjoyed! Looks good, we also have a good fishmonger nearby; alas no scallops. look out for Breco Seafood Packs – so Prawns from them at Checkers in Sandton City yesterday – they do the scallops we get.